The Michigan Supreme Court heard a Michigan personal injury case related to inherent risk. In this case, two men were golfing. One was driving the golf cart when it collided with the other man. Their stories differ about whether the cart suddenly struck the injured man or whether the injured man jumped in front of the cart. For the purposes of this appeal, it was irrelevant which scenario was correct. Here, the court looked at whether being hit by a golf cart is an inherent risk of golfing, as the driver of the cart argued. Conversely, they could have found that being hit by the cart is not an inherent risk of golfing. Whether the risk is inherent or not is relevant because it determines the standard of negligence that needs to be applied. These cases are always extremely fact-specific, which is why it is so important to contact a skilled personal injury attorney as soon as possible after an injury. If, as the driver of the cart argued, being hit by a golf cart is an inherent risk of golfing, he would need to be found reckless in order for the injured man to recover damages from him. However, if being hit by a cart is not an inherent risk of golfing, the golf cart driver would only need to be found negligent to be liable for the injuries. 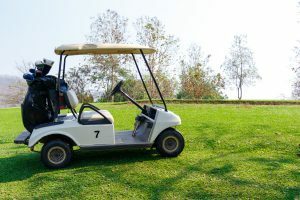 The lower court focused on whether golf carts were part of the “essence of golf.” However, the Michigan Supreme Court held that this was not the proper inquiry to determine whether being hit by a golf cart is an inherent risk of golf. Instead, the proper inquiry is whether the risk was reasonably foreseeable. They did not decide whether the risk in this case was reasonably foreseeable but remanded the case back to the lower court to apply this test to determine the appropriate standard of care. If you are injured due to the recklessness or negligence of someone else, you should contact a knowledgeable sports injury attorney as soon as possible. The attorneys at Neumann Law Group will analyze your case to determine your rights and responsibilities. Neumann Law Group is located in Western Michigan and regularly has clients in Detroit, Kalamazoo, Saginaw, Southfield, Grand Rapids, Lansing, and Traverse City. Call 800-525-6386 or use the contact form on this website to schedule your free consultation today!